Killer Characters: 12 Days of Vintage Toys -- and a GIVEAWAY! 12 Days of Vintage Toys -- and a GIVEAWAY! Liz McCall here, and I need your advice. Dad spent his evening in a creative endeavor, which is sometimes truly wonderful--but at other times incredibly scary. (And sometimes both.) But he was up almost all last might making what he says is a perfect ad for our vintage toyshop, Well Played. Before I unleash it on our friends and neighbors, I thought I'd test it out. Comment below and tell me something you remember from your Christmases as a child, and you'll be entered to win a (signed) copy of Death of a Toy Soldier, the first book in the Vintage Toyshop mystery series. Make sure you include your email in a safe format (Name AT Provider DOT com) so I can contact you if you win. International readers may enter,but if you win, your book will not be signed. Edited to add: Forgot to put a cutoff time. I'll choose a winner on Thursday, December 1st at 5pm eastern. Liz McCall grew up in a playful winter wonderland but it was never her dream to manage her father’s vintage toyshop. However, after he sank his entire police pension into the business, someone needed to help him turn his dreams into reality—and keep him from sneaking off to patrol the not-so-mean streets of East Aurora, NY. My grandmother always spent the night Christmas Eve. We learned when we were older that she was in charge of filling the stockings. Looking forward to this new series! Thanks! I remember asking for pink notebook paper. It was the hight of fashion to have in school. The video sorta scared me. The monkey and druming santa... nerdsrgood at msn dot com Thanks for the chance to win. I got some ragdolls one Christmas. They were my favorite. I remember the wonder and amazement of Christmas morning. Running down stairs to see the miracle that happened over night when Santa brought your first bike! And who ate the cookies and drank the milk you set out? Truly blissful times. mlarkin at rmrgroup dot com. in the kitchen). The doors weren't opened again until after I'd gone to bed on Dec 25.
along with lots of other presents. It was magical. thanks for the offer of the book. Lately I keep thinking of the Christmas cookies we made with my Dad, he had started to make them with my kids. Everytime I taste one it tastes like home. I remember my sister and i sleeping in the same room on Christmas eve so we could stay up late watching the snow hit the window and hoping to catch a glimpse of Santa claus. Love that video, that will be my new favorite version of The Twelve Days of Christmas. And I want the tree with the little toys. Some of the old toys bring back memories. We would always read A Night Before Christmas and then off to bed. Back up at midnight after Santa arrived, and in the morning there would be long support hose stocking filled with fruit, nuts, candy and little gifts, that Santa came back to leave. Gifts were not elaborate but plenty, and always new PJs to read the new books in. Strange traditions when I thought about it after growing up, but felt like home so I continued with my children. Most Christmas morning when we kids my father worked (Chief of Police). My dad would take the midnight officer home. We could see him driving down the road which was our sign it was just about time to run down the hall to the living room where our tree was. It was so exciting to see what Santa left for us. Such memories. Thanks. Lsum1258 at aol dot com. One of my favorite memories is when we were able to fool my mom about her gift. I remember lots of laughter as she was trying to guess. I love those old vintage toys, they require imagination unlike most of the video games so popular now. When I was very young we lived upstairs over my family's office. There were two apartments, ours in the back and over the store itself my friend Patty's family. I think they were Polish Catholic and they always made a big splash for Christmas. The tree seemed to fill the living room and reached up to the ceiling. One year her uncle dressed up as Santa and on Christmas morning we all woke up to a lot of noise on the roof. There coming down the roof access ladder was Santa. He had a bunch of pillow cases stuffed with presents for ALL OF US! That year Hannukah and Christmas overlapped so the parents decided that they'd celebrate both together and it was a blast. That was my first experience with Christmas. The following year I was put into a Religious Day School and we moved away. I remember mom making her fruitcake and making me wait until it had aged a few days before I could have some. It wasn't that gooey kind you get in the stores. It had a more cake like batter and was wonderful. I love that you had many Hallmark ornaments on your tree as I work for a corporate Hallmark store. The 12 days video is cute, although ever since I read Stephen King's short story about the cymbal playing chimp, I look at that toy in a different light. I forgot my email, which I suppose you need. We celebrate Hanukkah - so no Christmas memories. I do remember lighting the menorah and playing cutthroat dreidel games. My brother was always determine to win everyone's pennies. We went with my father to get cigarettes. Very unusual behavior. When we got home Mother insisted we just missed Santa. If we looked up we could probably see him. Didn't see him but sure enough he had been there! I like to remember how happy my parents were when we opened our gifts and how surprised and delighted we were with our gidts. After opening gifts on Christmas morning, we would have a great Christmas breakfast and dinner and spend time enjoying our gifts. 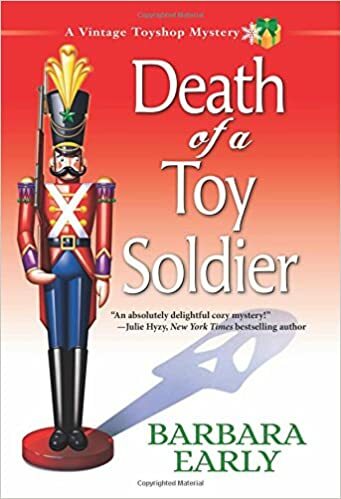 Can't wait to read "Death of a Toy Soldier". I loved that Twelve Days of Christmas video!!! One of my favorite memories was when my mom would wake us up ( at about 5 in the morning ) and we would go into the living room to peek at what Santa brought. Then we would all go back to sleep. Thank you so much for the chance to win!!! I remember how I excited I was that Santa brought me a Cabbage Patch Kid. Thanks for the chance. One of my favorite memories among many... is going over to the 1820's Tavern Museum on a snowy day and looking at all the antique toys and a 12 ft. tall Cedar tree covered in smaller toys and candles. The Curator dressed up in 1800's clothing and they served Russian tea and cookies. The smells of Cookies and baking was wonderful. 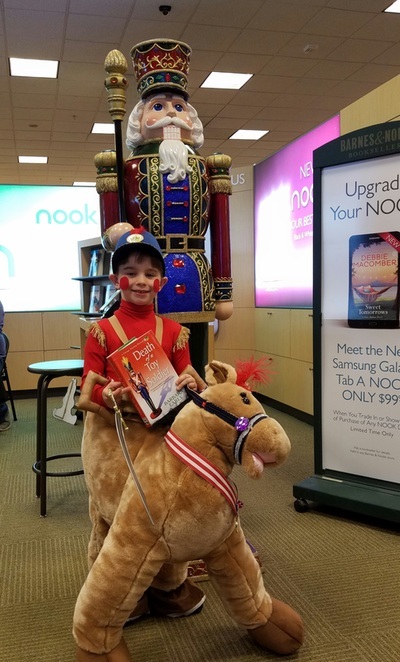 After fifteen years of working in Museums in Texas I finally came back and got a job in that same Museum and I love the kids that come in for Christmas reacting to all the toys...Your book sounds wonderful. We had the official gift opening, etc. on Christmas day. Christmas Eve we got one gift to open to tied us over. We were allowed to open one present on Christmas eve. One year I received a Barbie doll and a huge wardrobe for her. My Mom had made a ton of gorgeous clothes for my Barbie. I had the best dressed doll on the block. Everyone under 15 opens one present on Christmas Eve. We usually guide the older kids to games and the wee ones to PJs. Then on Christmas morning we open presents in age order around the room. One of my very favorite memories: I grew up on the plains of South Dakota, not many trees around (there are many more now since people have planted trees.). My parents would go to town to buy a Christmas tree and my dad would hide it somewhere on our many acres. Then on a Saturday before Christmas, my brother and sisters would go out to find it. Sometimes we found it quickly but sometimes we spent a lot of time outside hunting down that tree. Our version of cutting our own tree. Special memories! I have so many wonderful memories of my childhood Christmas's. Favorite memories would be going every year to pick out and cut a live Christmas tree. This is the first year without my dad, mom and brother (mom and brother both passed this year) so right now I have to say they are all my favorite because I had my whole family. I wanted a Revelon Doll one Christmas. My mom took an old doll, dressed her up in a whole wardrobe my Mon had made, and she was wrapped under the tree. I wasn't sure what she was but I loved the clothes. My Revelon Doll was my last gift under the tree. Boy was I surprised. I had a blessed childhood. So many precious memories. Christmas was a time for family. I can recall one year that my sister woke up so early it was still dark. That was it we were all up before the sun. A fun thing I remember was always getting a new cabbage patch kid from Santa each year and the excitement of moving the mouse on the advent calendar each day. A pitiful thing that really sticks out is the one year I snooped...never again! My mother baking gingerbreadmen and shared with neighborhood kids. The best part of Christmas was the large train display my Dad put up every year. Complete with buildings, people, trees, snow, etc. I can still remember the smell of the train as it whistled and chugged smoke as it rode the tracks (with little wooden pieces to resemble the boards under real tracks. Such detail put into s fantastic Christmas display and a treasured moment of past Christmasas. One favorite Christmas was when I got Garfield and Smurf stuff. I was 10 years old and got a stuffed Garfield, Smurf, and Smurfette. I think I got a big Smurf comic book too. I also got a Garfield cat book that told about different cat breeds, etc. One of the things I definately remember from my childhood Christmases is getting to open a gift on Christmas Eve morning. Yeah, that morning. Then we opened all the rest of our gifts on Christmas Eve evening. Also, everyone tried to be the very first to say "Christmas Eve Gift" to whoever we saw or spoke to. My maternal grandfather could not wait for Christmas and I've always understood that the gift opening early was his idea -- both us kids on the morning and then all of us on Christmas Eve. The trying to be the first to say "Christmas Eve Gift" has carried on with my family, and now my daughter's. My sister and female cousin also has tried to keep the tradition alive, but not sure how their children have done. I love Christmas now and know it's a holdover from all my happy childhood Christmases. My mother and stepfather worked so hard to make the holidays memorable for us. We didn't have much money when my mom and biological father divorced and those first Christmases were very, very hard for my mother, who worked three jobs to make ends meet. In spite of that, those first Christmases were some of the happiest in my life. Then she married my stepfather, and we had a real family. We always began baking well in advance so we could give visiting neighbors a gift platter of goodies and we could take gift boxes filled with goodies to friends and neighbors. I remember the year I got new figure skates and was jumping around shaking the box wildly. Mom and dad looked so strange while I'm singing - new skates, new skates. Well, I had to try them on at the store so I knew what they were. I finally settled down and opened the package - a new clock radio, and all in one piece! I was the youngest of 3 for several years. From age 4-7 my older siblings would wake me up somewhere between 4 and 5 am on Christmas morning and tell me to go wake our parents. My mom would look at the clock, pat me on the head at tell me to come back at 6 am. The three of us would sit and stare at the unmoving hands on the clock until 6. Now I swear, we put up the decorations only to get them right back out! It comes way too fast. My best and family favorite is of baking cookies together. And decorating the tree. My favorite Christmas toy was a circus I got around 1950. It had small characters including the ringmaster, performers and sideshow "freaks." It also had three rings and 2 sideshow stages, so I could set up the whole circus. I played with it for hours and hours. Tiny Tears was the doll to have during the Christmas season of 1956 and I wanted her very badly. My birthday is Nov. 4 and I received Tiny Tears for my birthday! I was very happy but Santa apparently got word that I already had my new baby for that year and he didn't bring me another one so that is what I remember about that Christmas. Three years later I was surprised with a tin dollhouse in the form of a schoolhouse. It came with a resin teacher and students, desks for all and a blackboard. This is a priceless memory!